Two Way Voice Communications, Live GPS Tracker, Lone Worker and “Proof of Presence” in a single device. Plus Real-time alarm and event reporting via ACTIVE VIEW. 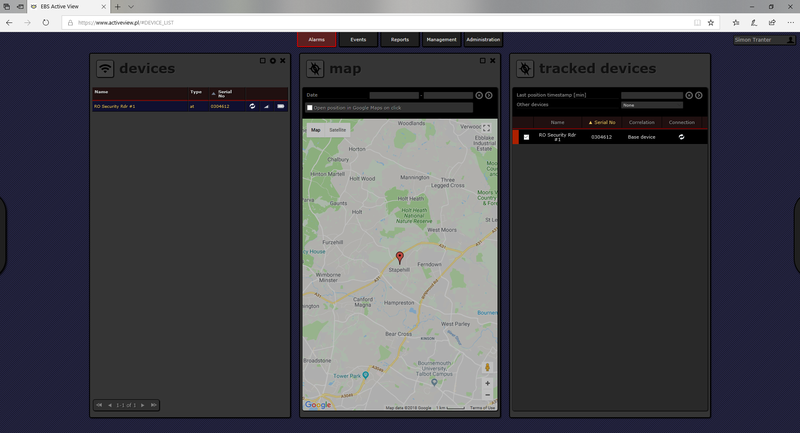 ACTIVE TRACK is a handheld easy to use device designed for two-way voice communications, GPS tracking, lone worker protection and proof of presence reporting, with all events and alarms monitored in real-time via a cloud-based web portal called ACTIVE VIEW which is available 24 hours a day 7 days a week. In addition to ACTIVE VIEW web-based reporting ACTIVE TRACK can send SMS text messages regarding GPS position, Panic or Man down alarms to a designated mobile telephone, e.g. in a control room. Email alerts can also be sent to a manager or supervisor informing them that a member of staff has not arrived on site or if the patrol has not been started or completed. ACTIVE TRACK incorporates a quad band GSM/GPRS voice enabled modem that we fit with a special roaming SIM (optional) that attaches to the strongest mobile signal in your local area. It includes a fixed allowance for Voice, SMS text and data usage. The mobile number associated with the SIM card allows ACTIVE TRACK to accept incoming telephone calls (with options to restrict). The integrated “Call Me” button allows the operative to request a call back via a message in the ACTIVE VIEW web portal. The same button can also be used to call a designated number in an emergency. A feature that keeps call costs to a minimum and avoids the type of abuse that is often associated with Smart Phone use. ACTIVE TRACK has an embedded GPS receiver that allows it to be tracked outside using standard satellite-based positioning technology. 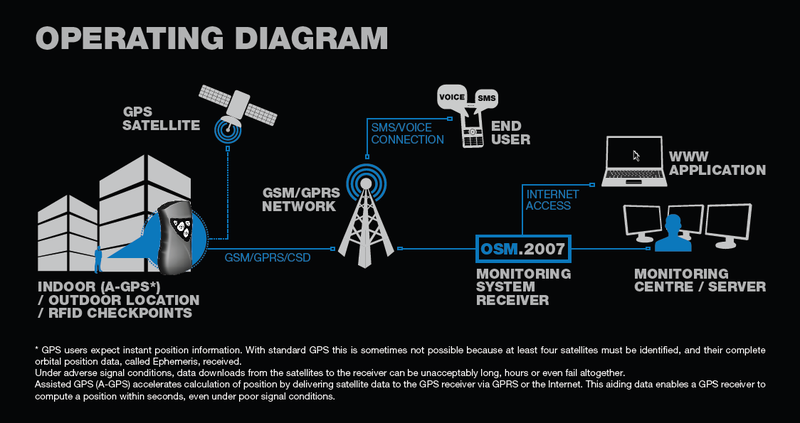 When inside advanced AGPS technology, which is based on triangulation information from cell towers is used to supplement the satellite-based information to allows the device to be tracked inside rooms (in most cases). A GPS button on the device can also be used to send a SMS text message to a designated mobile telephone with co-ordinates that can be used to locate the device on Google Maps. Panic Alarm – ACTIVE TRACKS integrated Panic button can be used to request urgent assistance via a direct message to the ACTIVE VIEW web portal or via a SMS text message to a designated mobile phone. This message can also include the last known coordinates of the device when activated that can be used to display the devices location on Google Maps. Man Down Alarm – ACTIVE TRACK incorporates an accelerometer that monitors the orientation and movement of the device continuously and any deviation from pre-programmed parameters, e.g. no activity for 15 minutes or the device remains in a horizontal position for too long, will automatically initiate a SMS Man Down alarm that can be sent to a designated mobile phone with the last known GPS co-ordinates for the device. A direct alarm will also appear in ACTIVE VIEW. ACTIVE TRACK incorporates an RFID reader that can be used to read RFID checkpoints that can be named and placed around a customer site to help identify locations that require regular checks. By activating the Read Checkpoint button the checkpoint will be read immediately and its assigned name will appear in the ACTIVE VIEW event log in real time. The ACTIVE VIEW web portal has been designed to allow the system administrator a great deal of flexibility. They can create multiple companies. Each company can have multiple sites and each site can have multiple checkpoints. When checkpoints are registered they are named and assigned to a specific site. Multiple Tours can be created that define a set of rules that state when each site and checkpoint must be visited. You can also specify the order and time ranges for these visits and if any exceptions occur, these can be reported to a manager via email or alarm message in ACTIVE VIEW. Completed Patrol reports can also be emailed to a manager, supervisor or a client via an easy to use report scheduler. Geo Fencing also allows a specific geographic area to be defined for a specific ACTIVE TRACK device that will result in alarm, if the device goes outside of the specified area. All the advanced features described above are provided in handheld purpose-built case that is extremely rugged and is both shockproof and waterproof. The battery cover tamper and impact detection facility help limit vandalism by disgruntled personnel who just do not want to be monitored! And ACTIVE VIEW real time monitoring of the battery charge and mobile signal strength enhances the operational performance of this truly advanced Two-Way Voice, Personal GPS, Lone Worker and Proof of Presence real time monitoring solution. If you would like a trial of the system or would like further information, please do not hesitate to call our sales team on 0800 8174259.